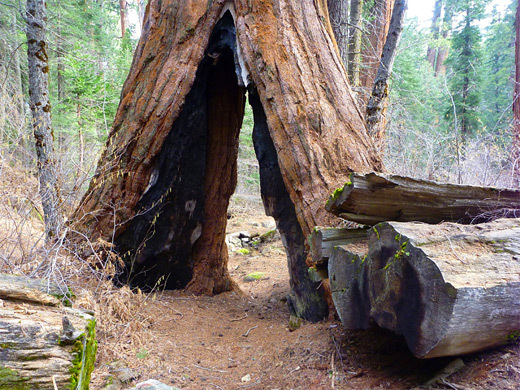 Although the southern section of Giant Sequoia National Monument contains 22 sequoia groves, only six are easily reached, being within 2 miles of a paved road; the remainder need longer trips, on trails or forest tracks. Second in popularity to the main visitor area at Long Meadow Grove is Camp Nelson, a dispersed woodland community 32 miles east of Porterville along CA 190, as from here three groves may be visited by short trails - Belknap Camp, McIntyre and Wheel Meadow, of which the latter two are most scenic, spread out along the deep valley of the South Fork of the Middle Fork of the Tule River. The 3.6 mile Camp Nelson Trail passes right through both groves, starting in the west at the end of a narrow road from Belknap Campground, and in the east from a parking area beside CA 190, 1,650 feet higher. For hikers, the trip is one way but the path is also popular with mountain bikers, who can make a ten mile loop using a cut-off trail and a section of the highway. Snow persists in the upper reaches of the Tule River valley until April, but the trail is usually hikable from mid March. 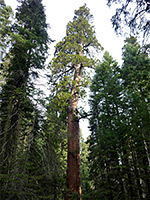 The lower grove (McIntyre) is more visited since it lies closer to the road; the higher section of the trail is much less used, yet still easy to follow, and encounters somewhat larger and more extensive sequoias. Topographic map of the Camp Nelson Trail. 14 views along the Camp Nelson Trail. East of Springville, at the edge of the Central Valley, the next few miles of CA 190 are relatively straight, following the Middle Fork of the Tule River into the mountains, but the highway becomes steep and very winding past the point where the river divides into north and south forks. Although all the surrounding area is part of the Sequoia National Forest, there are private inholdings all along this section of the highway, including a large power generating station at the river confluence, and as the hillsides are too steep for any side tracks, there are no places for primitive camping. CA 190 reaches Camp Nelson (32 miles from Porterville), then the smaller village of Cedar Slope (35 miles), soon after which the highway becomes somewhat straighter and less steep, and has a few wide verges suitable for camping or overnight parking. It reaches the upper trailhead for the Camp Nelson Trail after 39 miles, located beside a marshy meadow, shortly before Quaking Aspen Campground. A notice at the trailhead gives distances as 4 miles to Cedar Slope and 6 miles to Camp Nelson, but these include connecting routes at the far end; the actual length is 3.6 miles to the lower trailhead, which is at the end of a narrow road extending east from Camp Nelson, passing many woodland cabins. This trailhead is unmarked except for a small sign bearing the route number (31E30). From the meadow by the upper trailhead, elevation 6,850 feet, the path runs between the road and a stream (the very upper section of the South Fork of the Middle Fork of the Tule River) for a short distance, slopes down gently through relatively open woodland and begins the main descent, dropping steeply via a dozen switchbacks, long and short. Initially, gaps in the forest allow views across to high, rockier slopes to the south, which hold snow much later in the season, but soon the trees close in, as the trail descends to the bottom of the valley. It fords the river, still just a narrow mountain stream, and enters Wheel Meadow Grove, passing the first few sequoia, before crossing two equally small tributaries. This marks the end of the steep section, as the remainder of the trail has only shorter drops, alternating with longer, flattish stretches. 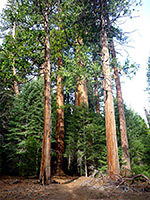 The path generally stays between 50 and 100 feet above the river, on the southwest side, encountering many dozen sequoia, though the big trees are never very concentrated, occurring in groups of 5 to 10; most are scattered, spread out over about one mile. 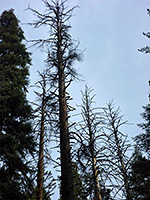 As ever, some are fire damaged, and the living sequoia are mixed with ancient, fallen, moss covered trunks in various stages of decomposition. The path eventually moves closer to the stream, as the sequoia fade away, and a gentle descent reaches a junction with a short track from Cedar Slope. 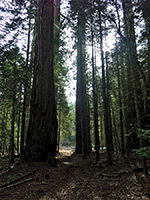 The continuation of the trail, now wider and more well used, proceeds northwest through mixed fir-oak woodland, until the sequoia reappear at the edge of McIntyre Grove. Here, some sequoia are just as big as in Wheel Meadow Grove, but the trees seem less extensive, and the path passes maybe only 30 giants. It crosses to the north side of the Tule River via a bridge improvised from a fallen tree, past just a few more sequoia, at the far edge of the grove. The trees are mostly oak now, the surroundings bushier and more overgrown, as the route descends over two tributary streams, the latter (McIntyre Creek) right beside the western trailhead, at the end of the narrow road from Camp Nelson. Parking here is very limited, and the place is reachable by cars only, not RVs.